A yellow tint to the skin or eyes caused by an excess of bilirubin, a substance created when red blood cells break down.What is newborn jaundice? Newborn jaundice is a yellowing of a baby’s skin and eyes. 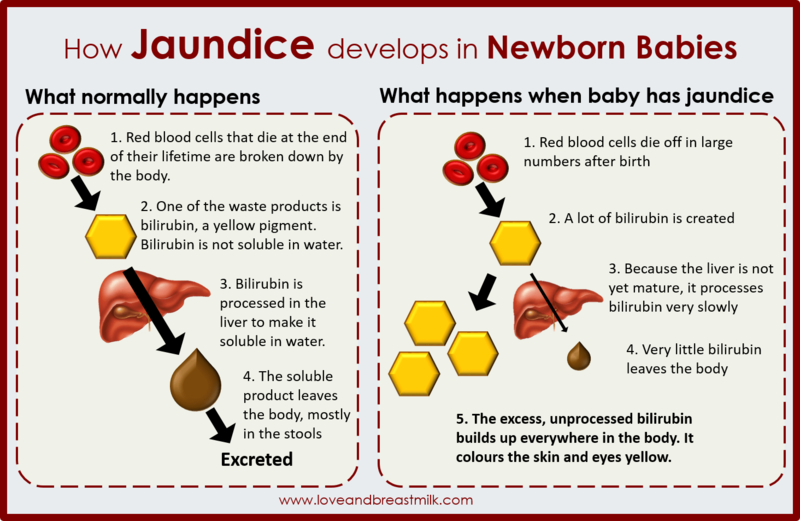 Newborn jaundice is very common and can occur when babies have a high level of bilirubin, a yellow pigment produced during normal breakdown of red blood cells. In older babies and adults, the liver processes bilirubin, which then passes it through the intestinal tract. However, a newborn’s still-developing liver may not be mature enough to remove bilirubin. The good news is that in most cases, newborn jaundice goes away on its own as a baby’s liver develops and as the baby begins to feed, which helps bilirubin pass through the body. -In very severe cases, an exchange transfusion may be necessary. In an exchange transfusion, a baby receives small amounts of blood from a donor or a blood bank. This replaces the baby’s damaged blood with healthy red blood cells. This also increases the baby’s red blood cell count and reduces bilirubin levels.